US Secretary of State is to leave for London, while Iran’s chief negotiator expressed doubts over a deal. NEGOTIATIONS BETWEEN SIX world powers and Iran over Tehran’s nuclear ambitions were thrown into uncertainty this evening after US Secretary of State John Kerry announced his imminent departure, and Iran’s chief negotiator expressed doubts a deal would be reached. Amid signs that the talks in Geneva were proving difficult, Kerry’s spokesman said the US’s top diplomat would leave for London tomorrow for meetings with British counterpart William Hague and the Libyan prime minister. At the same time, Iranian chief negotiator Abbas Araqchi said he doubted that Tehran and the P5+1 world powers — comprising the United States, Britain, France, China, Russia and Germany — could reach an accord by the end of the day. The talks are aimed at securing a freeze on parts of Iran’s nuclear programme in order to ease fears that Tehran will develop atomic weapons, in return for modest sanctions relief. The arrival of foreign ministers – including Kerry – today had raised hopes, after three days of intense negotiations among lower-level officials, that a breakthrough was in sight. Kerry had decided to join the talks “with the hope that an agreement will be reached,” the US State Department said yesterday. Since their arrival however, officials from both sides have indicated that there are still considerable differences to be bridged. “We have now entered a very difficult stage,” Iranian Foreign Minister Mohammad Javad Zarif told state television, saying he would not bow to “excessive demands”. “In any agreement, (uranium) enrichment in Iran will not be suspended,” Zarif said, adding that “a very difficult task” still lay ahead in clinching a deal. Mark Hibbs, from the Carnegie Endowment for International Peace, said Kerry’s imminent departure might “set a deadline and focus people’s minds”. Just two weeks ago, the ministers had jetted in seeking to sign on the dotted line, only to fail as cracks appeared among the powers — fissures that officials say are now repaired. Since being elected in June, Iranian President Hassan Rouhani has raised big hopes that after a decade of rising tensions over Tehran’s nuclear programme, a solution might be within reach. Email “Uncertainty over progress in Iran talks as Kerry set to leave Geneva”. 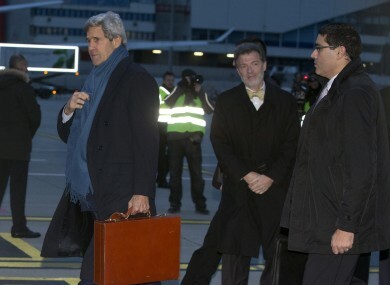 Feedback on “Uncertainty over progress in Iran talks as Kerry set to leave Geneva”.